An incredible travel value, this 4-Pc. 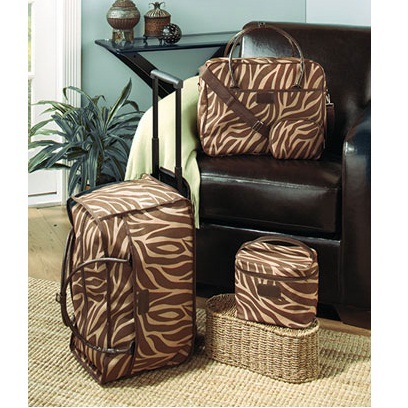 Luggage Set in Zebra also offers a great, stylish look. Whether taking an extended trip or just an overnight, this set covers all your needs. Bring all four pieces along, or take just the one or two you need. The tote has double handles and a zippered closure. The carry-on has an outside pocket (zippered on Floral and open on Animal), an adjustable, removable shoulder strap and a handle that pulls out approx. 15″ from its zippered compartment. The cosmetic case features a zippered closure and an elastic strap inside to hold three items. Made of leather-like vinyl and polyester. Imported.